There are still many people who believe that anyone pointing out “chemtrails in the sky” and asking questions is somehow out of tune with reality. 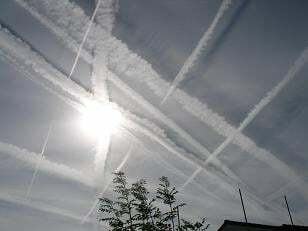 But this is slowly changing as geo-engineering and its effects cannot be kept under wraps any longer. So it is not surprising that the first to come out on mainstream media are so called experts. Playing on the current (in my opinion manufactured) “scientific consensus” that the earth is warming and a climate catastrophe is imminent, they call on geoengineering to be regulated on a global scale. Controversial geoengineering projects that may be used to cool the planet must be approved by world governments to reduce the danger of catastrophic accidents, British scientists said. Met Office researchers have called for global oversight of the radical schemes after studies showed they could have huge and unintended impacts on some of the world’s most vulnerable people. Packed nicely into the language of preventing catastrophic incidents and protecting “some of the world’s most vulnerable people” they argue for a global “sign – off” by governments. “The massive complexities associated with geoengineering, and the potential for winners and losers, means that some form of global governance is essential,” said Jim Haywood at the Met Office’s Hadley Centre in Exeter. It is interesting to note that this comes from the Hadley Centre, the same institution that was at the centre of the “climate-gate scandal”. Some of the most prominent advocates of manmade global warming are working there. The dangers arose in projects that cooled the planet unevenly. In some cases these caused devastating droughts across Africa; in others they increased rainfall in the region but left huge areas of Brazil parched. The warning builds on work by scientists and engineers to agree a regulatory framework that would ban full-scale geoengineering projects, at least temporarily, but allow smaller research projects to go ahead. All in all it is a half hearted attempt to justify the massive stratospheric geoengineering that is going on and by asking for an international regulatory framework they hope they can legalize their past catastrophic actions. They acknowledge that there are “massive complexities associated with geoengineering” (and by extension massive complexities with climate science in general). If these scientists and experts were serious they would simply admit to the fact that climate science is far from an agreement on the scale of global warming or even if it takes place at all. Instead of calling for an immediate end to stratospheric geoengineering and pleading guilty to having messed up the natural cycles of the weather patterns they now want the absolution by international regulation making geoengineering legitimate retrospectively. And of course there is no mention in this mainstream article about the military use of weather modification and the HAARP facilities. Neither is there any information about the ingredients found in the toxic mixture that is sprayed and its effects on all living things.